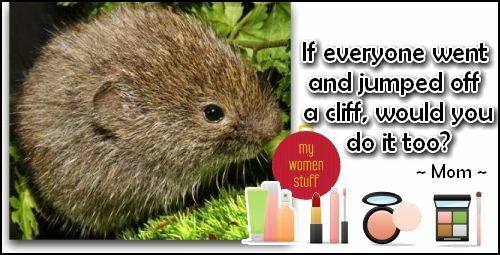 Home » Musings » Whats your Lemming? Since its the holiday season and all, I don’t think many people are online so instead of talking about products, I’m going to investigate this term “lemming” that I used to know as a noun and which is now a verb. I used to know of “lemmings” as small rodent type creatures that popular myth had us believe would every so often run off a cliff and plunge to their deaths. Could “lemming” have stemmed from the fact that the hype whipped up by the wants and online egging on made everyone follow the other in a huge mass group until you fell over the cliff i.e. bought the item you were “lemming”? Or could it have stemmed from the term that had people following the popular opinion unquestioningly with unhappy consequences e.g. wanting something so badly because everyone else likes it and then finding it does not work for you. Either way, it appears that “lemmings” are here to stay. PREVIOUS POST: Did Silica Powder cause Nicole Kidman’s makeup malfunction? Excellent post! I agree with the first definition although the second seems accurate but I don’t think it applies to everyone. hmm…. no more lemmings for the rest of the year! Ooh! Sounds intriguing those blushes! Will wait for your review. Tell me about that darned bandwagon! 😛 My CC isn’t here yet eeps! LOL! I never knew of the myth behind the “lemmings”. Ok, as for the forum version of “lemmings”… … Actually I am quite satisfied with what I have right now. And am not lemming for anything in particular. Maybe because I currently have a stockpile of items that I predict will take 2-3 years to finish using… … hahaha. what a superbly ingenious post! i never really found whats this “lemming” word means but kinda get a hint that it was something which is wanted so badly. LOL… glad it was of some insight! for makeups, I am satisfied too! 🙂 I am probably lemming for a SPA and full relaxation! 🙂 Happy new year! I hope you get what you want next year! Happy New Year! aahh lemming? so many… one of themm… of cos the Dior blush who’s wearing a lace..dang!! pretty! At first glance, I was lemming spring collections: Dior, BB (the new stripe shadow palettes), and even EL. But the more I stare, the more I realize that they are all repeats of the same colors & combinations. I’m lemming Givenchy, Illamasqua, NARS spring, and can’t wait to see the sheer Shiseido spring lipsticks, or anything that’s really different. It’s not spring yet, and I’m so over pretty corals and pinks. I guess most collections are similar colors in different variations but its how they are put together that makes them pretty. I love corals. Well there’s always a first for everything! So cute right? Why would something so cute kill itself?! I would like to have the Esprique Precious Symphonic Fit Eyes palette in purple and pink. Tried the neutral one when I bought it in Tokyo and fell in love with the quality. Very nice. Regret that I didn’t get the one I actually like but got neutral coz I thot I would use it more (for work days). I must agree with you. My lemmings grow because of reading blogs LOL… I haven’t seen the Esprique palette you mentioned but it must be pretty for you to want more colours! Oh, it was out just maybe 3 weeks ago? Perhaps its released after you came back from Japan. Its awesomely blendable for the netural palette I tried. Quite sheer too (as always for Japanese e/s), but I like it this way. Some people comment that they didn’t realise I put on e/s as it is very near my skin colour until they catch the reflects from lightings.